Lewis Builders of Carmel, one of the premier design/builders in Monterey County, has won five design/build awards from remodeling industry publications, including a gold, two silvers, a bronze and a Chrysalis Award for Remodeling Excellence. Carmel, CA, September 19, 2018 — Lewis Builders of Carmel, one of the premier design/builders in Monterey County, has won five design/build awards from remodeling industry publications, including a gold, two silvers, a bronze and a Chrysalis Award for Remodeling Excellence. >2018 Gold Award Winner, Professional Remodeler Magazine, Whole-House over $750,000. This flip of a 1960s home resulted in a “Sold” sign after only 10 days on the market, thanks to the complete floorplan makeover and design updates that take advantage of the beautiful ocean views and natural light. The ocean views accessible from the side of the house were maximized by three corner windows (in the kitchen and two master bedrooms) and three extra large patio doors. Five oversize skylights allowed natural light to fill the spaces not overlooking the water. Professional Remodeler’s Design Awards recognize outstanding remodeling projects in 23 categories. Entries submitted by U.S. residential remodeling companies are judged on quality, design expertise, material choices, problem solving and creativity. Award winners are determined by a panel of 10 expert judges from the remodeling industry. >2018 Master Design Awards, Silver Award Winner from Qualified Remodeler Magazine • Outdoor Living. The 40th annual Master Design Awards highlight innovative design solutions that helped to produce exceptional remodeling projects. >2018 Master Design Awards, Silver Award Winner, Qualified Remodeler Magazine • Universal Design. The 40th annual Master Design Awards highlight innovative design solutions that helped to produce exceptional remodeling projects. >2018 Bronze Award Winner from Professional Remodeler Magazine, Outdoor Living over $100,000. The award was for an addition or significant remodel that extends living space into the outdoors. Projects may include landscaping, covered or uncovered patios, outdoor kitchens; etc. >2018 Regional Outdoor Living over $75,000 at the 2018 Chrysalis Awards for Remodeling Excellence. The Chrysalis Awards program, begun in 1994, recognizes the nation’s best work in 15 general categories of residential and commercial remodeling. The Chrysalis Awards are open to any professional remodeler and design professional in the United States. Lewis Builders is an award-winning design/build firm that can make your dream home a reality. Located in Carmel, CA, we create beautifully designed homes specifically tailored to complement your lifestyle and increase your home’s value. Carmel, CA, June 27, 2018 — Lewis Builders of Carmel has announced it has won an award at the 2018 Chrysalis Awards for Remodeling Excellence. Lewis Builders won in the category Outdoor Living over $75,000, one of more than 90 remodeling companies from across the United States named winners. The entries were judged on overall design, the creative use of space and materials, and the degree to which the project enhanced the original structure. The Chrysalis Awards program, begun in 1994, recognizes the nation’s best work in 15 general categories of residential and commercial remodeling. The Chrysalis Awards are open to any professional remodeler and design professional in the United States. “We are honored to be recognized for the quality of our work and design from such a prestigious company,” said John Lewis, founder and owner of Lewis Builders. “In 1977, a developer built this house on top of a hillside with 360-degree city and mountain views, without any regard to how to enjoy those views,” wrote Lewis about the award-winning remodel. “Thirty-nine years later, the home finally blossomed with this new outdoor living space. Winning entries will be featured in July’s issue of Qualified Remodeler magazine. Pictures of the 2018 award-winning projects can be seen on Chrysalis website www.chrysalisawards.com and on www.porch.com beginning in late June. For more information about the Chrysalis Awards, contact Ken Kanline at 888-263-5687 or at info@chrysalisawards.com. Since 1993, the Chrysalis Awards have honored the finest remodeling projects in the country. Our goal is to provide consumers, remodelers, designers, architects and editors with a resource for remodeling ideas and to identify those companies that produce award-winning work. On this site, you can find remodeling ideas from all over the country, and also find the award-winning remodelers closest to you. Most of these award winners are capable of turning your ideas into reality, regardless of the region in which you find the idea. The awards cover almost every category and price range of remodeling, so regardless of what kind of project you are contemplating, you will find projects that fit any budget. Chrysalis judges are editors and writers of consumer publications such as Better Homes & Gardens, Woman’s Day’s Home Remodeling & Makeovers, Southern Living Magazine and Sunset Magazine. The projects are judged on design, use of materials, use of space and integration into the existing space. What makes these projects so relevant to you is that these judges apply their training to select projects they want the public to see just as they would do in their publications. Lewis Builders is the design/build firm that can make your dream home a reality. Located in Carmel, CA, we create beautifully designed homes specifically tailored to complement your lifestyle and increase your home’s value. The Hartnell Community Choir will present their spring concert at 3 p.m. Sunday, June 10, at Church of the Wayfarer in Carmel. Salinas, CA, May 10, 2018 — The Hartnell Community Choir will present their spring concert at 3 p.m. Sunday, June 10, at Church of the Wayfarer in Carmel. 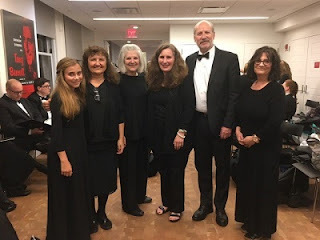 The choir, conducted by Robin McKee Williams, will perform “Lux Aeterna” by Morten Lauridsen, “Dark Night of the Soul” and “Evening Prayer” by Ola Gjeilo, “Even When He is Silent” by Kim Arnesen and “Alleluia Tropus” by Arvo Part. The program includes soloists from the east coast, San Francisco Bay area and Monterey Peninsula. The Gabrielle Ensemble from the Monterey Peninsula will be the guest orchestra for the performance. The choir is comprised of professional and volunteer singers. The Hartnell Community Choir was originally affiliated with Hartnell Community College and is now an independent organization that has performed at Avery Fisher Hall, Carnegie Hall, Steinbeck Center, Hartnell College and local churches. Building upon the solid backbone of a small ensemble, McKee Williams includes soloists and instrumentalists to fulfill her goal of enriching the community with beautiful music, while showcasing local talent and other world-class musicians she has met through her participation in the Distinguished Concerts International New York (DCINY) mentoring program for conducting. This summer, the Hartnell Community Choir will sing at the Ely Cathedral under the direction of Dr. Craig Jessop, formerly of the Mormon Tabernacle Choir. The choir was invited to sing in the Great Britain Choral Festival in Cambridgeshire, England commemorating the 100th anniversary of the armistice of World War 1. And, the choir will sing at the Vatican in June 2019 in the Rome Choral Festival. Baritone Krassen Karigiozov will open the program singing “Nemicco della patria” by Andrea Chenier accompanied by pianist Marina Thomas. Professor Karigiozov has sung operatic roles with New York City Opera, San Jose Opera, and the Spoleto Opera Festival. Born in Bulgaria, he has participated in and won international competitions in voice and piano. Kiril Havezov will sing “En Sourdine” by Gabriel Faure. Havezov is from Bulgaria and has sung roles on the stages of the most prestigious opera houses in Bulgaria. He has sung as a permanent guest soloist at the Sofia National Opera as well as sung operatic roles in the United States and China. Mezzo-soprano Veronica Jense is one of the featured soloists as well. She recently premiered the “Tale of Lady Thi Kinh” by PQ Phan and sang roles with Peoria Symphony’s production of “Cosi fan tutte.” Soprano Jody Lee, originally from Canada and now a resident of the Monterey Peninsula, is the featured soloist for “Song of the Angel” by John Tavenor. Soprano Cora Franz, from Baltimore, Maryland, is the soloist for “The Dark Night of the Soul” by Ola Gjeilo. Anna Yelizarova, an international opera singer will, sing “Amour! Viens Aider” by C. Saint-Saens. The Gabrielle Ensemble and is led by violinist Eldar Hudiev, and includes Astrid Huala, violin, John Wineglass, viola, Amy Anderson, cello and Alesksey Klyusknik, bass. Stewart Reynolds will play saxophone in the “Evening Prayer” by Ola Gjeilo. Marina Thomas and George Peterson are the featured pianists. There is a suggested donation of $25. For more information, call 831-649-0992. The Hofsas House Hotel, a 38-room boutique family-owned inn in the heart of Carmel, is pleased to announce the launch of its special packages for 2018. Salinas, CA, Dec 04, 2017 – The Hofsas House Hotel, a 38-room boutique family-owned inn in the heart of Carmel, is pleased to announce the launch of its special packages for 2018. The packages appeal to a wide variety of guests, from art and wine lovers to dog owners, chocolate lovers and those looking for a relaxing spa experience. 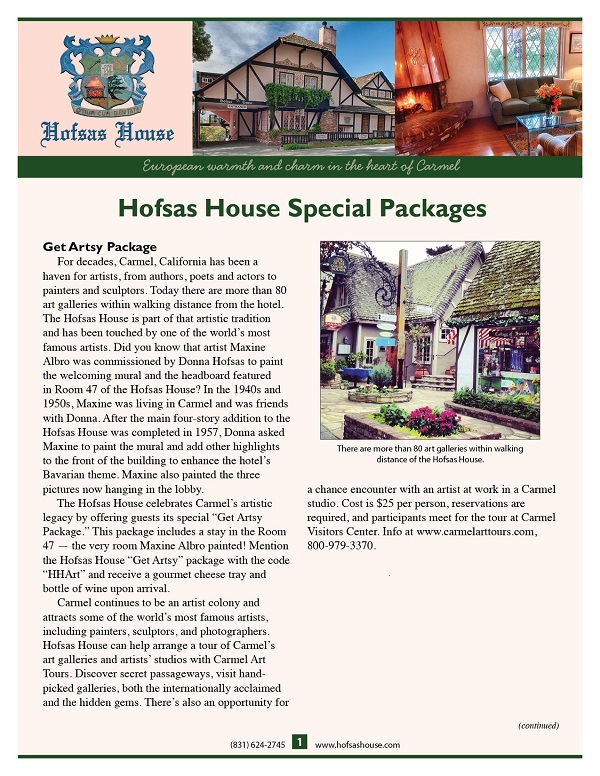 To book any of these packages during your stay, call (831) 624-2745 or email info@hofsashouse.com. For decades, Carmel, California has been a haven for artists, from authors, poets and actors to painters and sculptors. Today there are more than 80 art galleries within walking distance from the hotel. The Hofsas House is part of that artistic tradition and has been touched by one of the world’s most famous artists. Did you know that artist Maxine Albro was commissioned by Donna Hofsas to paint the welcoming mural and the headboard featured in Room 47 of the Hofsas House? In the 1940s and 1950s, Maxine was living in Carmel and was friends with Donna. After the main four-story addition to the Hofsas House was completed in 1957, Donna asked Maxine to paint the mural and add other highlights to the front of the building to enhance the hotel’s Bavarian theme. Maxine also painted the three pictures now hanging in the lobby. The Hofsas House celebrates Carmel’s artistic legacy by offering guests its special “Get Artsy Package.” This package includes a stay in the Room 47 — the very room Maxine Albro painted! Mention the Hofsas House “Get Artsy” package with the code “HHArt” and receive a gourmet cheese tray and bottle of wine upon arrival. Carmel continues to be an artist colony and attracts some of the world’s most famous artists, including painters, sculptors, and photographers. Hofsas House can help arrange a tour of Carmel’s art galleries and artists’ studios with Carmel Art Tours. Discover secret passageways, visit hand-picked galleries, both the internationally acclaimed and the hidden gems. There’s also an opportunity for a chance encounter with an artist at work in a Carmel studio. Cost is $25 per person, reservations are required, and participants meet for the tour at Carmel Visitors Center. Info at www.carmelarttours.com, 800-979-3370. Upgrade your stay at Hofsas House with a four pack of handcrafted artisanal sea salt caramels from Monterey’s Lula’s Chocolates and a bottle of award-winning Monterey County wine. Monterey County wines are now on par with California’s other legendary wine regions such as Napa and Sonoma. In fact, Wine Enthusiast magazine named Monterey County as one of the world’s top 10 wine destinations — ahead of the Napa Valley and in the company of the other famed wine-growing regions around the world. Monterey County produces 42 different varietals of high-quality, award-winning wines, especially Pinot Noir and Chardonnay. For this special package choose either a Monterey County Chardonnay or Pinot Noir from a personally selected list of wines. Lula’s Chocolates, founded by Scott Lund, are made the old-fashioned way, using recipes passed down from Scott’s grandmother, Lula herself. To this day, Lula’s makes sure each hand-dipped, small batch, deliciously fresh chocolate is an experience worth savoring. Cost for this wine-and-chocolate package is $25. Use the code HHChoc when booking this package. Cinq Mondes Spa Carmel is the French cosmetic company’s first and only Cinq Mondes spa in the United States and serves as the company’s flagship location in the U.S. Cinq Mondes Spa Carmel combines tradition, beauty, authenticity, and luxury, allowing guests to enjoy a soothing sensory voyage of the five different worlds in the nearby Crossroads Shopping Center in Carmel. Cinq Mondes has gathered a selection of traditional treatments from around the world that are remarkable for their quality, authenticity and ceremonial traditions. This special package must be booked at least 72 hours in advance and is subject to availability. Carmel-by-the-Sea, CA, November 09, 2017 – The packages appeal to a wide variety of guests, from art and wine lovers to dog owners, chocolate lovers and those looking for a relaxing spa experience. To book any of these packages during your stay, call (831) 624-2745 or email info@hofsashouse.com. Hotel Announces New Package The Charms and Delights of Carmel-by-the-Sea. Carmel, CA, May 21, 2015 – Vendange Carmel Inn & Suites announced its new Charms and Delights of Carmel-by-the-Sea package. The charms and delights of Camel are not easily experienced in a single day. So why not take advantage of a special offer of two nights in the luxurious surroundings of Vendange Carmel Inn & Suites, Carmel’s only wine-themed hotel. Book two nights, Monday through Thursday, for only $20 more, and get a $50 gift certificate to Carmel’s popular seafood restaurant Flaherty’s Seafood Grill & Oyster Bar or Andre’s Bouchee, the chic French bistro with a California coastal flair. But take advantage of this special offer soon, it’s only valid through June 15th, online only at vendangecarmel.com. When Brian and Jonathan Lee sought inspiration around the transformation of their family’s Carmel inn a few years ago, they looked no further than Monterey County’s Wine Region. Faced with a major renovation and re-imagination of the property the Lees once owned but sold seven years ago, the answer became obvious: Name the inn Vendange (French for “vintage”), capitalize on its supreme location, design everything around a wine theme and create two stunning, fully equipped barrel rooms” for traveling families or couples. The Lees had the idea to partner with local wineries, especially those with tasting rooms in Carmel (currently there are more than two dozen tasting rooms, wine bars and bottle shops in the village, and the Carmel Wine Walk is thriving). The wine-centric idea was to have wineries “adopt” a room at Vendange, putting their personal stamp on the furniture and décor. Each suite now provides a romantic ambiance of luxuriousness and charm. Following the lead of Twisted Roots were: Galante, J. Lohr, McIntyre, Dawn’s Dream, Joullian, Ventana, Manzoni, Tudor, Cima Collina, Holman Ranch and Blair. The novel idea allows the wineries to reflect their own style and statement through the rooms, while Vendange allows the wineries to use the rooms for clients or wine club members to create valuable cross-promotion. “For us it creates a cachet and makes it a unique experience,” Lee said. The family also created the two adjoining “barrel rooms,” designed ideally for couples rooms to create a relaxed “hang-out” experience. Each room is more than 900 square feet, with separate bedrooms, radiant floor heating, private patios, personal entrances and parking spaces. One room comes equipped with a high-end kitchen, complete with granite countertops, Viking appliances and all the comforts of home. Whether it’s a walk around the manicured gardens, or quiet conversation and complimentary wine and cheese tasting around the fire pit under a lighted pergola, guests at Vendange find themselves pampered in an intimate environment with expert, attentive service. Nestled beneath the pine trees in a tranquil neighborhood, Vendange Carmel Inn & Suites is one of the few inns in Carmel to provide parking. Located just a short walk from Carmel’s legendary downtown, visitors can absorb a complete wine experience in and out of their suites. Lee points out that “vendange tardive” means “late harvest” in French. The phrase refers to a style of dessert wine where the grapes are allowed to hang on the vine until they start to dehydrate, concentrating the sugars. “It fits because we want guests to come here, rest and get sweeter for the next day,” he said. Might this be a start a new of foot sensitive vacationing? Carmel-by-the-Sea, CA, April 07, 2015 – In Carmel-by-the-Sea, the Theis family is celebrating more than six decades of European hospitality at its beautiful Bavarian-inspired Hofsas House Hotel, which is as charming as the town itself. With firm roots in the past, the family is looking toward the future by keeping abreast of guests’ every need. 1. It saves money on gas. Lots of it. 2. It saves the planet. You’d be doing your bit to save the world. 3. It saves on parking. Don’t you just hate having to pay for parking? 4. It’s free. The pleasure of knowing you are getting something for nothing while other people have to pay is not the same as benefiting from saving money. It’s even better. 5. It’s good exercise. The benefits are obvious. Ask your doctor. 6. You’ll get more fresh air. It’s the best kind. So, where should you take your next car-free getaway? The Theis Family offers the top 10 things to do without a car in Carmel-by-the-Sea. When was the last time you want on a vacation without a car in California? 1. Walk on the beach and finish your night with a glass of wine . 4. Take a 20-minute stroll down to the Carmel Mission and tour the Carmel Mission Museum (http://www.carmelmission.org/museum/). 5. Go on a Carmel Walks (http://carmelwalks.com/) tour to learn about the history of Carmel and some of our unique City ordinances. 6. Combine food, wine, chocolate and history of Carmel by taking the Carmel Food Tour (http://www.carmelfoodtour.com/). 7. Go to the Carmel Cheese Shop (http://thecheeseshopinc.com/) to sample cheeses from around the world. It is hard to select just one and then purchase a matching wine to take to the beach to watch the sunset. 8. Learn about the famous poet, Robinson Jeffers, by taking the Tor House Tour http://www.torhouse.org/). 9. Happy Hour Tour: Ask our concierge to direct you to an assortment of happy hours (e.g., Vesuvio Restaurant, www.vesuviocarmel.com, Barmel, Jack London’s, Il Fornio and many more) right in town for discounted drinks and appetizers, and then finish off the night with a special entre at one of our favorite places to eat. 10. Arrange a surf lesson for half of the day at Carmel Beach, http://southbaysurfriders.com/. A professional surfer will take you out and ensure a safe and enjoyable time learning to surf Carmel’s amazing waves! If those 10 activities were not enough, the Hofsas House staff picked these great events. 1. Rent bikes at Bay Bikes (www.baybikes.com) and get a challenging workout up and down Carmel’s hilly back roads. Or, stick to the flatland and cruise by the beach for a wave-side bike ride. For the experienced rider, take it up a notch and bike 17-mile Drive into Monterey and back for an all-day outdoor adventure. 2. For the spa lovers, relax at Kush Day Spa (www.kushincarmel.com), one of the highest regarded spas in Carmel, for one afternoon. 3. Rise early—or rise late—for a wonderful Sunday brunch at Clint Eastwood’s Mission Ranch (http://www.missionranchcarmel.com/restaurant.htm). It’s only a 20-minute stroll across Carmel. Better yet, return on a weekend night for drinks and live piano playing. 4. Find all the hidden courtyards Carmel-by-the-Sea has to offer, and see what surprise gift you can discover for a friend. 5. On a chill day, go coffee tasting at the various local coffee houses in Carmel, Carmel Coffee House and Carmel Valley Coffee Roasting Co, who roast their coffee right in the area. 6. For photography lovers, Gallery Sur (gallerysur.com) has amazing prints from the area or go to Weston Gallery, one of the oldest photographic galleries, www.westongallery.com. 7. Drop by the Carmel Art Association (carmelart.org) for details on local artists and the best galleries to explore according to your taste. 8. Tapas at Mundaka, www.mundakacarmel.com. 9. Carmel Wine Walk-by-the-Sea – stroll to 15 different wine tasting rooms and taste a flight of Monterey County grown grapes. Purchase a Wine Walk Passport at the Hofsas House for $65 and it includes nine tastings. Because of the cool air, Chardonnay and Pinot Noir are some of the best. 10. Geocache in Carmel: There are over 20 geocaches within walking distance in Carmel. Take your GPS and test your navigation skills and find some treasure! 11. Check out the live performances at one of our four theaters: Sunset Center, Golden Bough, Cherry Center in our one-square mile town. 12. Olive oil and balsamic vinegar tasting at Trio Carmel on Dolores Street south of Ocean Avenue – www.triocarmel.com. 13. Create your own custom perfume at Ajne Perfumery in the Court of the Fountains – http://www.ajne.com/. 14. Visit one of the oldest houses in Carmel, the First Murphy House, home to the Carmel Heritage Society, http://carmelheritage.org/. Owned and operated by the Theis Family, Hofsas House Hotel is within walking distance of everything Carmel has to offer, including a stunning beach, fine restaurants and shops and wine tasting. It provides peaceful respite and European charm just minutes from Monterey, Pebble Beach, Big Sur and Pacific Grove. The Hofsas House’s 38 spacious, one-of-a-kind rooms boast European comfort and lovely views and amenities such as fireplaces, private balconies, wet bars, kitchens and patios. Large suites provide the perfect stay for newlyweds and anyone else seeking an extra special getaway. Dutch doors in every room allow guests to welcome in the ocean air, and free WiFi enables them to stay connected — if they want to. The Hofsas House Hotel family works to ensure every visitor’s experience is special, striving to offer the highest quality personal services. Consider the continental breakfast, abundant with fresh French Roast coffee, tea, juice, fruit and pastries from a neighborhood bakery, or the personalized concierge services for guests and their families, including their four-legged family members, who are welcome as well. For large groups — wedding parties, company meetings, family reunions and others — Hofsas House Hotel offers a spacious room equipped with a fireplace and full kitchen that can comfortably accommodate 40 people. A heated pool, dry saunas, decks with views and off-street parking are on-site as well. Hofsas House Hotel is located on San Carlos Street, north of Fourth Avenue in Carmel-by-the-Sea. For more information, call (831) 624-2745 or visit www.hofsashouse.com.